Today was the day that I’ve been looking forward to for such a long time. I woke up and looked outside my hotel room to see a semi-circle sun rising at the end of the ocean. I was in Islamorada all the way down in the keys of Florida. I was down with my uncle, cousin, and brother we were getting ready for our annual fishing trip that we take every year. We got dressed, hoped in the car and made our way down to the docks. Even though I’ve been here before, everytime I get to the docks it’s so amazing the see how many boats are docked in the warm crystal clear water. Theirs dead fish being brought back by earlier fishers and the smell was something you had to get used to. Our captain was Captain Dave, but he preferred to be called just “Capt.”I knew that because we always go out to sea with him whenever we come down. He greeted us with dirty hands and he smelt like salt water so I knew this was going to be a good trip. We brought everything onto the boat and set sail. It takes a while until we get to the fishing point, because in able to catch the big ones we have to go so far out. As the boat is flying across the water we see a school of dolphins on each side of the boat. For that quick moment in time nothing really mattered, because this was one of the most amazing moments in my whole life. I remember hearing my cousin shouting that this was insane and it was such a fascinating sight to see. From seeing the dolphins, I knew that it would be the last time we see a fish that big today. After about 45 minutes the boat finally stopped and i couldn’t even see the land that we set sail off of. Everyone woke up from sleeping and went to the back of the boat. We pulled out all of the fishing rods and but the bait on the hook. The one thing I noticed was different from our previous trips was that the bait that was selected was so much bigger. I knew that that could only mean one thing...we were going for fish much bigger. The captain threw in the bait and now all we could really do was wait. 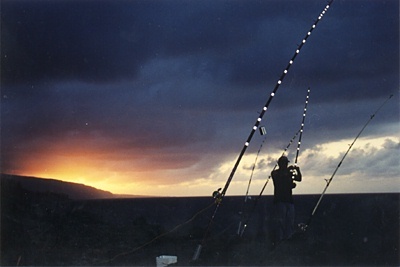 The main part about fishing for everyone was patience, so we sat there and waited for that rod to bend like a rainbow. Nothing was happening, not one fish would come on our line. No matter how many times we changed the bait, moved locations, and sat and waited for a fish we still were getting nothing. Hours passed by and it became a reality that not one fish will go on our line today. Captain Dave talked to my uncle and decided that it was time to head inwards. The worst part was the long ride back to shore knowing that we failed today. It was a year long wait for this fishing trip and we came up empty handed for the first time ever. Once we got back to the docks we gathered evrything that we brought and slowly walked off the boat. Capt apologized for how the day went and promised us that next time we would catch many fish. It was tradition to go and eat at this place called “Lazy Days” where ironicly they cook fish that you have caught. It was such an awesome restaurant as it was on the beach and one glance to your left and it was the clearwater ocean with islands and small fish and turtles all around. Everyone seemed so upset at the fact that we didn’t catch anything, and so was I but it changed. As I looked at the ocean and the bright blue sky with the sun out and warm weather I honestly had nothing to complain about. I was in Islamorada with my uncle, cousin, and brother. For the 12 months I spend in New Jersey and half of them having cold weather I finally got to be somewhere warm were I could just have a good time. I should have reflected on the present and realized that even though catching a fish would have been so much fun, I could do that anytime, anywhere. What I was living in this preticular moment is still to this day on of the most amazing palces I have ever been. It’s hard to really focus and pay attention to the important things in life, and I really learned that on this trip. Times like these don’t come very often so you have to appreciate all of the great things you have going on your life and never let the bad things hold you back and distract you from being the best you could be in the present. This was a time were i was not appreciative for what i had in my life and the story behind a fishing trip that taught me this.